Is there anything better than chocolate for breakfast? That’s a rhetorical question, because I don’t think there is. 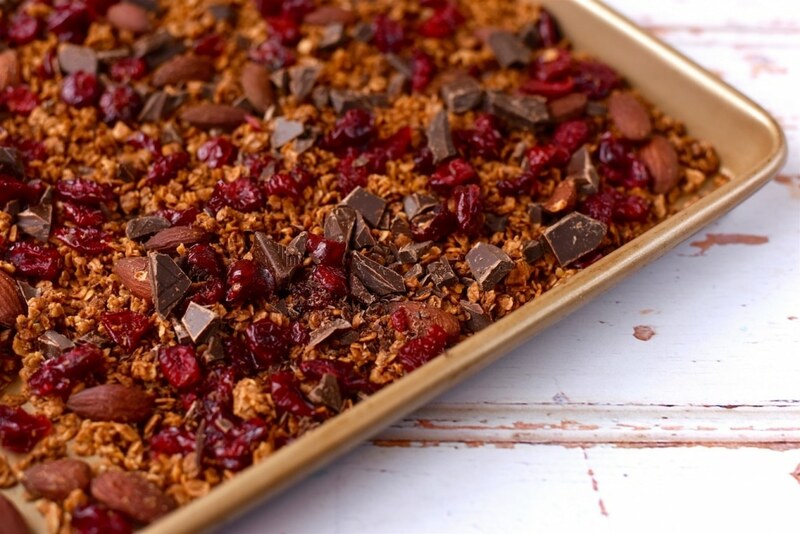 It doesn’t have to be as indulgent as it sounds, as a little bit of dark chocolate goes a long way in this Dark Chocolate and Cranberry Granola recipe. Chocolate and cherry is such a classic flavour combination, but what about chocolate and cranberry? A combination that is usually reserved for Christmas, I don’t think it gets enough love the rest of the year and this granola recipe is is a great way to bring a little taste of Christmas to a springtime breakfast. 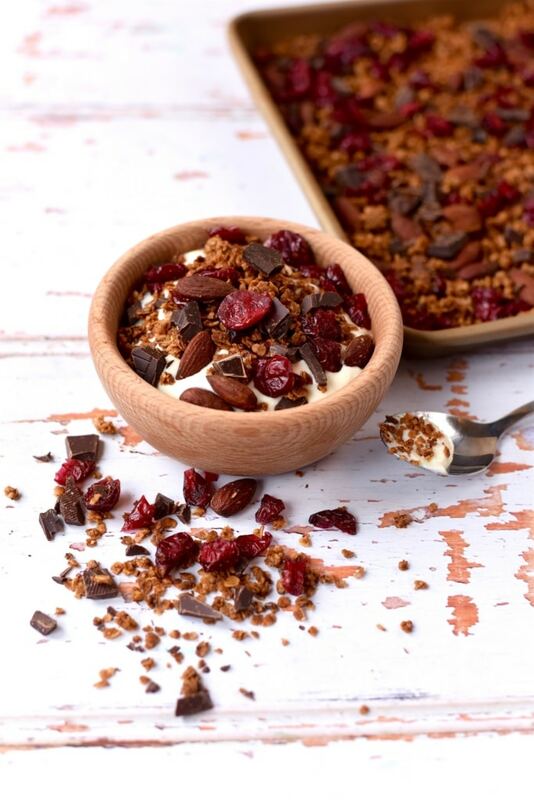 Do you want to be kept up to date on delicious and healthy recipes like this Dark Chocolate and Cranberry Granola? Please subscribe to the blog mailing list (it takes 30 seconds). You will get the new recipes sent straight to your inbox. Your email address won’t be passed on to anyone and you will never be spammed. Click here to sign up. 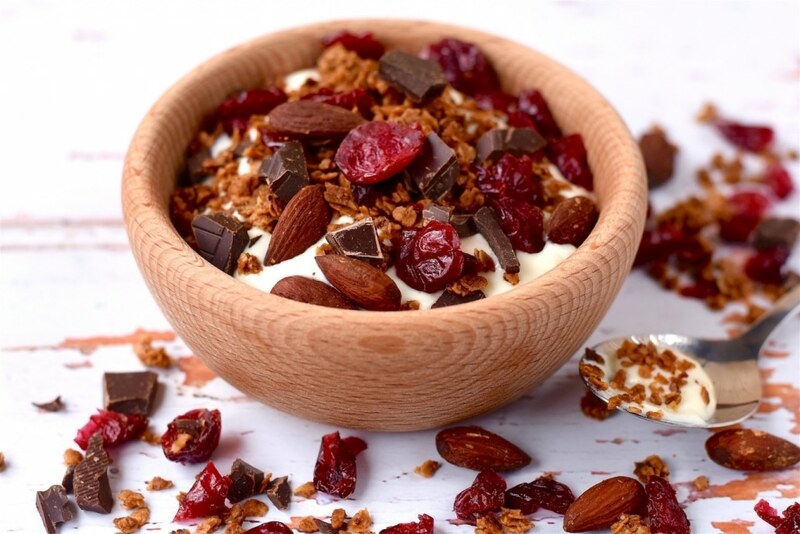 Granola, usually made up of a base of rolled oats and honey and baked until crisp, dates back to the late 1800’s, where it was served at a health spa in New York. It died out when the spa closed in the early 20th century, and then made a revival in the 60’s when fruit and nuts were added to it and it was promoted as a health food, which all of the hippies at the time loved! I am always surprised at how much “gourmet” granola brands can get away with charging for a bag of jazzed up granola. The basic ingredients of granola are some of the cheapest around and just by throwing in some dried fruit/nuts and some chocolate they can bump up the price tag by 50%. Why am I surprised? Because it’s SO easy to make yourself at home, and the best bit is, the flavour combinations are almost endless. As I general rule, some kind of nut/seed and some dried fruit at a good place to start, but we have so much chocolate still left over from Easter, that some of that had to get thrown in as well. I used to be one of those people that thought “what’s leftover chocolate?”, but now I know and to be honest, it’s not the worst problem in the world to have. I know there are tonnes of cake recipes out there to use up leftover Easter chocolate, or you could just melt it down and make cornflake crispy cakes (wow, it’s been years since I have made those), but this is something a little different, and something you can enjoy for breakfast. Breakfast has now gone from comforting bowls of porridge, overflowing with toppings, to a bowl of something light and crunchy. It can even be eaten on the go, as we want to spend as much time outside when the weather is nice. 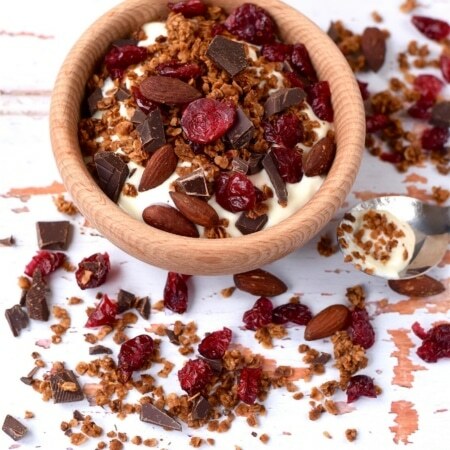 You can do so much with granola too! It doesn’t just have to be eaten out of a bowl with milk – you can eat it with yoghurt, or use it to top muffins with. Cranberry and dark chocolate granola muffins sound like something I am going to try very soon. You can make up a big batch of this and just keep it in an airtight container for two weeks. Or a day or two, which is about as long as it lasts in our house! Every time one of us walks past the jar we can’t help opening it up and having a sneaky handful or two of it. It’s got fruit in it, so it can’t be bad! We also take a bag of this out with us if we are going on a long hike, as it is light, nutritious and high in calories if you eat enough of it, so it makes good hiking fuel. Don’t be put off the high calorie part though, it’s a good amount of calories to have for breakfast if you just eat one serving of it. But that’s the hard part, just eating one serving. Is there anything better than chocolate for breakfast? That's a rhetorical question, because I don't think there is. 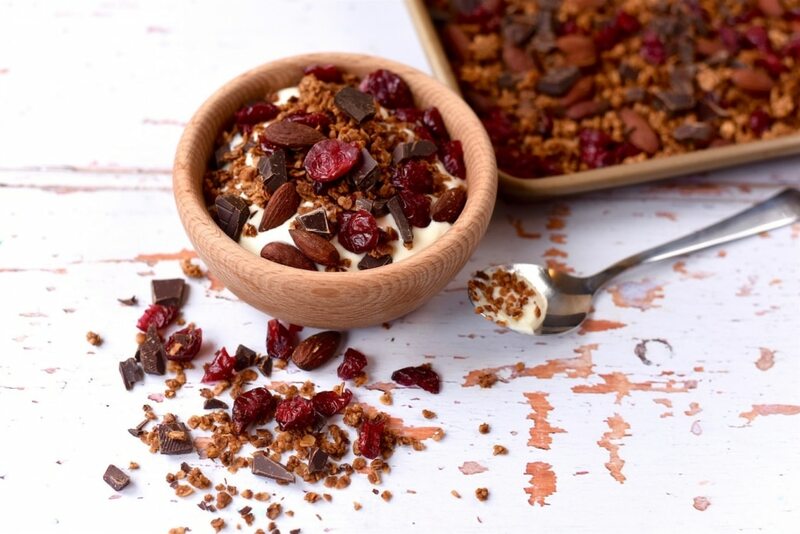 It doesn't have to be as indulgent as it sounds, as a little bit of dark chocolate goes a long way in this Dark Chocolate and Cranberry Granola recipe. Preheat the oven to 200C/400F and line a large baking sheet with grease proof paper. Place the honey and coconut oil in a pan and melt over a low heat. Add the remaining ingredients, except the chocolate, and mix well. Pour the granola on to the baking sheet and spread it out evenly. Transfer to the oven and bake for 20 minutes, stirring halfway. Allow the mixture to cool to room temperature and then add the chocolate and mix. Transfer to an airtight container and use within 2 weeks. Oh my gosh. This granola looks the best. And no, there is nothing better than chocolate for breakfast! 😉 I can’t wait to try your recipe! I love making homemade granola and especially when it involves chocolate. This looks absolutely Yummy! You are right, chocolate for breakfast is perfectly doable, antioxidants and all! 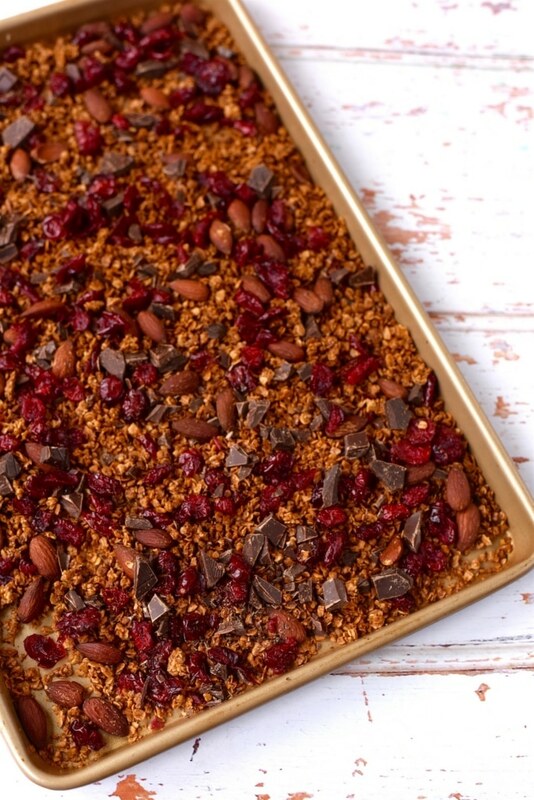 I love dried cranberries and this granola would not last an afternoon at my house! I’ve not made my own granola before but thankfully you have made it look like far less of a challenge than i thought. This looks delicious! This does look delicious and I can see cranberries working really well here, as you suggest, much like cherries but not quite. I also love that you are generous with the chocolate! 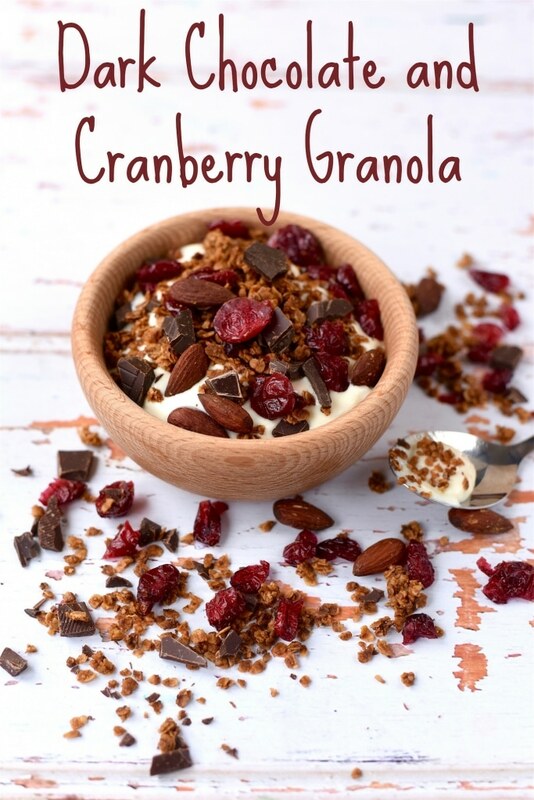 I love granola and this sounds amazing! I haven’t made my own so I will definitely give this one a try! I think chocolate for breakfast is my son’s dream. This looks healthier than giving him a bowl of coco pops. Aldi’s granola is quite nice though. 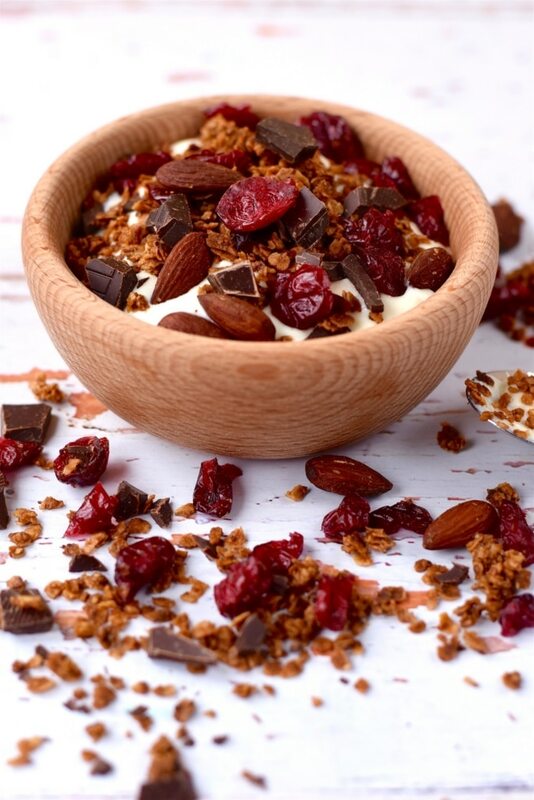 I like to eat granola with my yoghurt, it adds a wonderful crunch and makes it feel a little heartier. I don’t think I have ever tried the combination of cranberry and chocolate, but it sounds wonderful and this recipe looks great! I had a box of dark chocolate granola, when my normal pecan/treacle version was unavailable. It makes breakfast so decadent! I have chocolate in some form (be it a little or a lot) at every meal and often in between… so you know I love this! This looks like a much better option than all those processed chocolate cereals. I never would have thought to put cranberries and chocolate together. My kids love granola with yoghurt for breakfast and snacks, but I always buy it and you’re right, it’s so expensive. This looks really simple though, so I might whip up a batch today for when they get home. That looks very crunchy and yummilicious! However seeing as chocolate is far more appropriate than wine at breakfast, and much more likely to not send me off the rails, I’ll happily agree with you. Wow, so many incredible flavors in this dish! Now you have me craving a hot and filling meal.